Where to start? 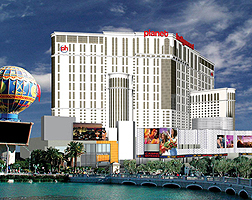 Vegas is a city of indulgence and food is a prime example. 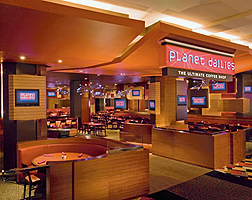 Whatever cuisine you prefer, you'll be able to satisfy your hunger at a variety of award-winning restaurants at Planet Hollywood. Steak, seafood, buffets…the list is endless. Eat the very best of whatever you crave. At Planet Hollywood Resort & Casino the food is already famous. Executive Chef John Schenk expertly grills prime cuts of beef in the David Rockwell-designed masterpiece Strip House, making dinner the highlight of any day. Or for a little Zen in your evening, stop by the preferred playground of the Hollywood elite - the exquisitely becalming Koi, for perfect feng shui in every bite. With mouth-watering dishes from all over the world, Spice Market Buffet is a perennial all-you-can-eat Vegas favourite. Drop into Yolos for a fresh take on classic Mexican. And 24 hours a day, Planet Dailies, the most high-tech coffee shop/cafe in town, is ready with over 200 menu items to choose from. When you need a caffeine hit or just a little pick-me-up, your favourite Starbucks beverage, the sensational sandwich inventions at The Earl of Sandwich, or a world-famous Pink's hot dog (or two) will give you back all the energy you need for some hard-core shopping, partying or gambling!